Nursing informatics competencies are fundamental to nursing practice in all areas of nursing work, including direct patient care, administration and education. The recent activity relating to the development of nursing informatics competencies for beginning level nurses has exposed a paucity of understanding of the requirements for nursing informatics competencies for nurse educators. 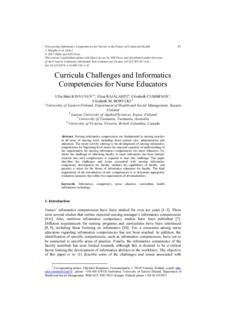 So, whilst the challenge of educating faculty to teach informatics has been limited, research into such competencies is required to meet this challenge. This paper describes the challenges and issues associated with nursing informatics competency development for faculty, outlines the capabilities of faculty, and presents a vision for the future of informatics education for faculty. The final requirement of the introduction of new competencies is to determine appropriate evaluation measures that reflect the requirements of all stakeholders.